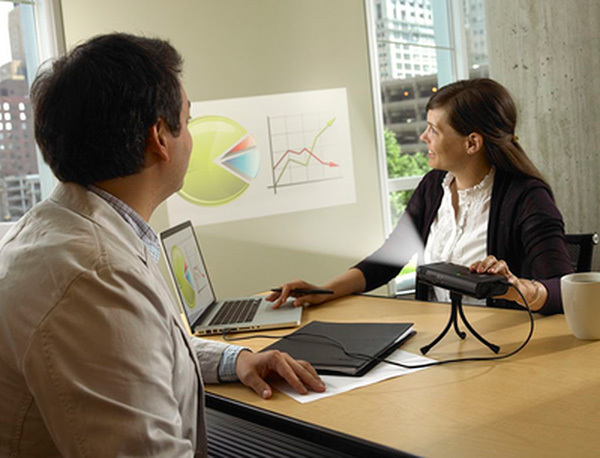 A projector can be an essential equipment in the office when making presentations, meetings, or any act that needs large graphic support. But not all offices have a projector by hand, either by price or because it has taken so far. Well, the new 3M MP220 may be the solution to this problem because it is a projector so small that we can hold in your hand and of course, bring along our laptop with almost without our noticing. With a footprint smaller than an external hard drive, the micro-projector 3M MP220 has a rechargeable battery and can read documents from its internal memory of 1 GB, so we can do without even the laptop for presentations, and they do not need or just plug into the network. It also has an SD card slot and a port for a USB pen drive. The MP220 incorporates an Android operating system for which we can navigate easily using a mouse, and its price is $600. We will see in more detail. 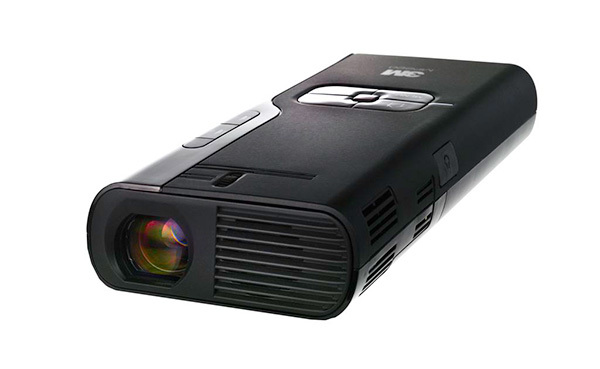 With a discreet and completely finished in black, the 3M MP220 has all the design features of conventional projectors, but with a super small size. In the front we find the optics with a small fan. At the top there are buttons for navigating menus MP220, as well as volume controls for the built-in speakers, the conference manual focus lens and the sensor for optional remote control. On the rear panel are located speakers, USB port, the connection to the external power supply and AV-VGA port for connecting cables, also optional. On the sides find an audio output in 3.5 millimeter stereo minijack for connecting external speakers, and a micro SD card slot. At the bottom is the battery compartment and tripod mount, yes, also offered as an option. 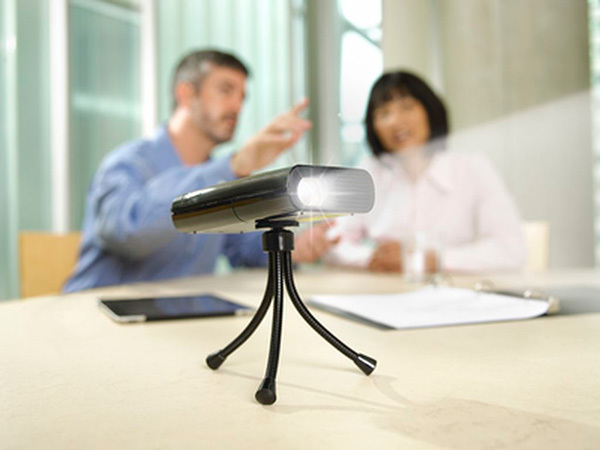 The 3M MP220 is a portable micro projector well suited to carry always with your computer and make presentations to small groups. It is therefore a very small and lightweight, with dimensions of just 157 x 30 x 80 millimeters and weighs 400 grams. The new 3M MP220 is equipped LED light source has a lifespan of up to 20,000 hours. It offers a brightness of 65 ANSI lumens and is capable of providing a projected image with a size of from 11 to 75 inches diagonal. The original resolution WSVGA (1024 x 600 pixels) and supports images up to 1440 x 900 pixel resolution. To make presentations easier and faster, the 3M MP220 incorporates an internal memory of 1 GB so that we can devote our documents and not have to plug your computer or laptop. We can also connect a memory stick pen drive or USB with the documents you want to play, or even a micro SD memory card up to 32GB thanks to the built-in slot. If we decide to use only the projector has to take into account the supported file types with the team. Thus, the 3M MP220 can read documents in DOC format (Microsoft Word), PPT (Microsoft PowerPoint), XLS (Microsoft Excel), text files TXT, and of course PDF documents. As for the media, our protagonist is compatible with GIF files, PNG, BMP, JPG, and MPEG-4, H.264, MOV & AAC and MP3 for audio or video formats. The 3M MP220 has an operating system very easy to use is based on Google's Android software. This feature allows you to navigate through menus in an intuitive and fast, and even use an optical mouse to operate it. The new 3M MP220 is not just for connecting conventional computers. With the optional adapter cable for Apple devices, we may also send submissions or any supported file type from an iPhone or an iPhone. This is a very interesting feature, as these Apple devices can play most of leftovers necessary documents in a presentation, so no need to carry your computer. In addition, if a meeting with a prospective client or shoot a video presentation from an iPhone through a micro-projector as small as the MP220, surely we will be offering a professional image can earn points towards us in achieving our goal. 3M also has two optional adapter cables, one for composite video and one composite video with audio input. These cables will allow us to use the MP220 with DVD players, digital cameras, game consoles like the Sony Playstation, Wii or Xbox and other non-Apple smartphones. To project on any site without having to be aware of having an outlet near the 3M MP220 incorporates a rechargeable lithium-ion polymer. This battery provides the MP220 a range of two hours of use. To recharge, simply plug the projector into the mains and leave it on about three hours to return to a full charge. The new 3M MP220 has a number of optional accessories that can be very useful, depending on the situation or what you want to connect. One of the most practical is undoubtedly the 3M tripod, which allows us to raise the projector to get the position and projection angle required. This stand has legs stretch of 28 centimeters and, when folded, is also very easy to transport. We have already mentioned adapter cables as an accessory to consider. Apart from the adapter for Apple, we also have a component video adapter and one for composite video, so that we can connect any type of player to the MP220. Another interesting accessory is the portable expandable screen from 3M. Although perhaps hits a little with the practical use of the MP220, as we will have to carry an extra accessory, the use of a screen for the projection is always recommended, as the fabric of the screens is designed to reflect light in a way more effective than any other surface. In this way we will make sure to always offer a good quality picture. This screen from 3M is extensible and supports images up to 66 inches diagonal. In short, the 3 M MP220 is an interesting team and practical. Its brightness of 65 lumens is hardly noticeable and could at least bring the remote control number or cable connection, but is a small and lightweight, has a complete connectivity and internal memory will allow us to leave the computer in the trunk . The 3M MP220 is now available at a suggested retail price of $600.